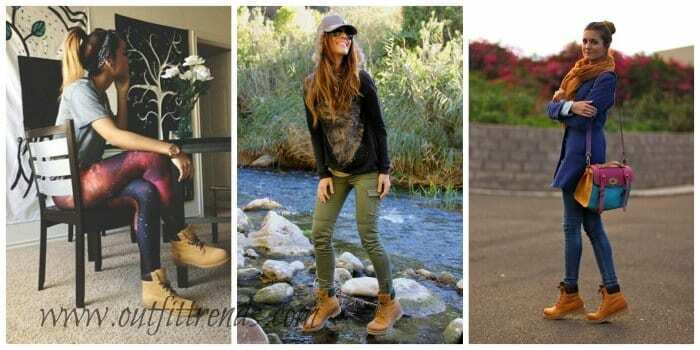 How to Wear Timberland Boots ideas – Are you looking for ideas what outfits to wear with timberland boots for a chic look? Well we are here to tell you some great tips for winter fashion and timberland outfits for teenage girls. Timberland’s are in fashion and the most classic boots. They have always remained popular among celebrities, men and women of all age. Timberlands are also best designed for kids and teens. They have been on top of the fashion trends since 90’s. No matter how old are you, you can still rock them. It’s one of those shoes that will never lose its charm. They are very comfortable and long lasting.The question that arises is what outfits to wear with timberlands? Well you have plenty options to wear with them. Young girls and teenagers can go for the most casual to formal wear, both. Timberland outfits can be selected according to your choice and preferences.Teenagers are avid fashion followers and they always show interests and enthusiasm when it comes to dressing. Today we will be focusing on timberland outfits for teenagers only. If you want to get in on the look then scroll down and have a look at the images. Timberland boots have been in the market since 40 years now and they have marked their presence. You will also see babies and kids wearing them. Hollywood celebrities are often seen carrying their kids wearing timberland. The boots have gained a lot of attention from fashion models, singers, actors etc. For teenagers they are a very comfortable wear. Teens can wear them for outdoor activities as well. They have become a necessary part of the wardrobe now a days.Lets see how you can style them with outfits. This is a perfect outfit keeping in mind the severe and harsh winters of the west. A beanie in neon is the best option for the somber environment.This yellow color is the one you must have if you like wearing dark clothes so this will act as a color pop for the outfit. Grey scarf and a matching half coat is looking fab for any day at the college. Winters arrive with a high demand in skinny jeans. Leather gloves and mustard timberland boots are a must for spending a day out having fun with friends. Overall the look is perfect, still if you want something add a red color to the lips. Going to the college means you need to dress up a little practically especially in winters as the clothing itself is heavy. And you can always exchange denim with black tights. Here the matching boyfriend coat and a graphic full sleeve shirt is a very good option showing a no nonsense attitude. a blue beanie with open hair should be your only fashion. Match faded blue boots and a shoulder bag for the books. Going to a hike or just an outing with friends? This is a super cute dress style in matching tones. Make use of your blue cardigan with matching jeans and a contrasting shirt underneath. 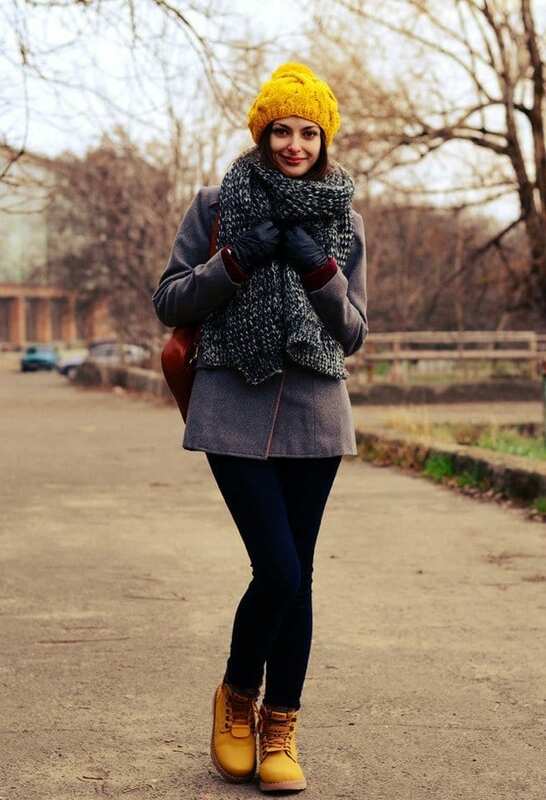 A mustard infinity scarf to keep out the cold winds and matching boots. Tie your hair in a bun. A little bling bling is always appreciated with natural makeup. Dolce and Gabana new floral bags or Moschino is the best option to choose a bag from. Aah! This styling idea doesn’t need any explanation. Choose a vibrant colored sweater or a floral print one, or a vintage one. Wear a collared shirt underneath, and take a bomber jacket over it. Blow dried hair is the best hair idea and a nice watch as an accessory. Boots doesn’t always mean denim. Now with such fashion forwardness you can match them with a short funky black graphic dress. It’s perfect for a lunch or a bar-b-q at your mum’s. Contrast the black with a camel color coat and long lace up boots. A chunky pearl necklace and a dash of pink on the lips. Black stockings to keep it decent with a nice beanie. You can take up a bag or not that is up to you. Pink is a very unusual color when it comes to boots but can pay off if worn properly. Now these pink timberlands look gorgeous with a black and white combination. Match the hand bag with the boot color. Dont forgeet a chunky black ring and bracelets will up the game. Sporty look and these boots? What else can you want if you are into athletics. Denim jacket will give a perfect cover for this game shirt. Pink Timberland shoes with Sweater and statement necklace over it. This winter uggs are also in trend and we talked about what outfits to wear with Uggs for glamorous look. You must buy timberlands and try different outfits with them. Teenager girls have many options. They can wear it with skirts, beanie hats, coats, sweaters, mufflers, mini skirts, pants etc. You can change the coat styles every day or you could also wear it with crop tops.Accessories are must. You can pick bags, clutches, statement necklaces, cross body bags, beanie hats, head bands etc. You can rock the boots in style. You can mix and match styles with your outfits from wardrobe.Timberland fashion boots are a must have for everyone. Young girls can take inspiration from the latest styles and trends from fashion. Whether you are going sporty to glam or pretty to funky you can style your clothing in whatever style you want. Hope you will take ideas from the pictures and create your very own look with your outfits. You can emulate different looks from 80’s as well for parties and wear boots with them. Timberland shoes with Ripped Jeans. Many girls are confused and keep asking questions in different forums like can i wear timberland with skirts ? how to wear timberland with skirts? Yes you can and you can wear them in winters also .Here are 30 best ideas to wear outfits with skirts in winters.Check out this girl how elegantly she matched her outfit with these boots. How celebrities wear Timberland Boots. cara delevingne look absoultely gorgoeous by wearing DKNY Hood Top with Timberland. KHLOÉ KARDASHIAN looks total chic by styling timberland boots with complete black outfit. Its just the African american style . But shouldn’t all te styles be for eevyone? I love your great outfits. Thanks for your nice post. I like your outfit lists, style, combination, and matching thickness. Especially I like your great boots. Would you let me know about your best shoe for me?